Come stay with us at our well-known fish camp, we have beautiful NEW riverside cabins that can sleep a family of up to 7. 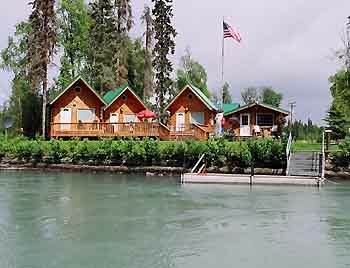 Our new cabins are equipped with gas heat, linen, Flat Screen TV, satellite reception, DVD players, wireless internet connection, Bar-B-Ques (one per cabin), restroom, shower snd a full frontal view of the Kenai River from 50 feet away! 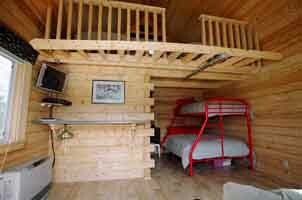 Our cabin prices start at $250.00/night (based on double occupancy). There will be an additional charge of $75.00/person for parties of more than two people. We have also reserved the right to fish for Sockeye's from our private boardwalk exclusively for the people staying with us at our camp. 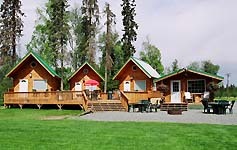 Camp or Hotel accommodations can be made when you place your reservations. Courtesy transportation is available to and from the local airports and hotels. Although we strongly suggest renting transportation so you can go site seeing. You will want to bring outdoor clothing for temperatures from 40 to 75 degrees. Snacks are recommended. Rainwear and a warm coat are also advised. Photography enthusiasts are reminded to bring a VCR or camera and plenty of film! You'll also need to bring your Alaska Fishing License and King Salmon stamp (purchase locally), as they are not available at our camp. Please add 2% sales tax to all of the following costs. Reservations need to be made in advance and a deposit is required. All charters include rods, reels, tackle, fish cleaning, coffee, Coca-Cola© beverages and an experienced guide.